(10/01/2018, 20:56)Michael Wrote: It was meant to be going to Washington. Its a typo - it is 5251 that has transferred. Imagine it has ended the life of 3889. (10/01/2018, 20:59)S813 FVK Wrote: Its a typo - it is 5251 that has transferred. 5327 is back from refurbishment, only 5305 - 5309 and 5337 (6) left to return now. Hopefully once the last Citaro arrives back, the first of the B9's will be due to arrive..... will they be arriving 2 a week or just 1? has anyone said why 6322 is not in yellow and green ? (10/01/2018, 21:23)Citaro5326 Wrote: has anyone said why 6322 is not in yellow and green ? (10/01/2018, 21:30)Michael Wrote: Night Angel? 6322 is yellow and green. Do you mean 6332? It is - that photo has been edited. Or at least i'd hope it has been - not a fan of those two colours together myself. (10/01/2018, 21:36)Michael Wrote: Looking at a photo on Busesnortheast, its 6322, photo by Neil Heskett‎. (10/01/2018, 21:39)S813 FVK Wrote: It is - that photo has been edited. Or at least i'd hope it has been - not a fan of those two colours together myself. Have anymore Omnicities left Percy Main for Washington or Stanley? With the last of the Citaro's arriving back to Deptford from Bus and Coach world, Will the Scania's and Vykings be moved to Riverside now, until 5305-09 and 5337 arrive back? (11/01/2018, 20:56)Michael Wrote: Have anymore Omnicities left Percy Main for Washington or Stanley? Technically 5305-09 are still Deptford's buses on paper, so the dual-door B7TLs will remain here for now. The usual question from yours truely. How long is the Streetdeck demo here for? (12/01/2018, 01:02)Rapidsnap Wrote: The usual question from yours truely. How long is the Streetdeck demo here for? Can anyone say which working the streetdeck demo is on today please ? No no no!! Lambton Worm is great brand and livery and Waggonway is a relevant to where it goes. I can't see any reason to change Toonlink, although you could give a new brand to the X70/71 - I'd like to see them, and the 15 perhaps, become Venture which is another good brand and livery. And what about Gypsy Queen for 13, 14 and X25, remembering a former operator in that area, although both words could be seen as having non-PC connotations! 5305 has returned from Blackburn, currently allocated to Deptford until the 28th January then will move to Riverside for the 26/27. (12/01/2018, 14:07)Greg_in_Weardale Wrote: No no no!! Lambton Worm is great brand and livery and Waggonway is a relevant to where it goes. I can't see any reason to change Toonlink, although you could give a new brand to the X70/71 - I'd like to see them, and the 15 perhaps, become Venture which is another good brand and livery. And what about Gypsy Queen for 13, 14 and X25, remembering a former operator in that area, although both words could be seen as having non-PC connotations! 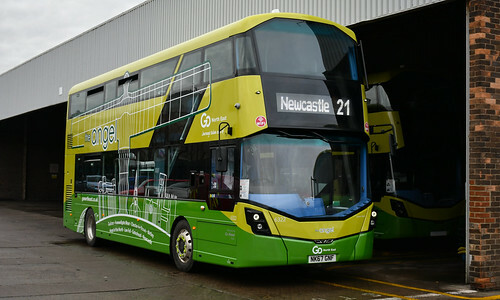 What ever happened to YJ62 FFB/9133 on Google search it's last company was Go North East. Has it got a private plate or exported abroad or anything, so strange!